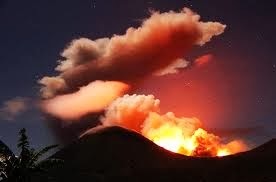 Mount Lokon had 2 strong eruptions on Friday. People living around the volcano have not received the order to evacuate. 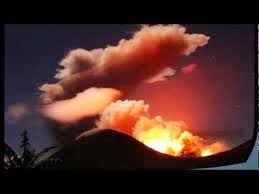 Since the volcano erupted the first time in April, a no-go zone of 2.5 km around the crater has been ordered by the government. 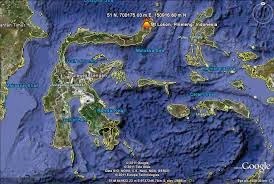 Mount Lokon is currently on the second highest alert in Indonesia. The twin volcanoes Lokon and Empung, rising about 800 m above the plain of Tondano, are among the most active volcanoes of Sulawesi. Lokon, the higher of the two peaks ( whose summits are only 2.2 km apart), has a flat, craterless top. The morphologically younger Empung volcano has a 400-m-wide, 150-m-deep crater that erupted last in the 18th century, but all subsequent eruptions have originated from Tompaluan, a 150 x 250 m wide double crater situated in the saddle between the two peaks. Historical eruptions have primarily produced small-to-moderate ash plumes that have occasionally damaged croplands and houses, but lava-dome growth and pyroclastic flows have also occurred.